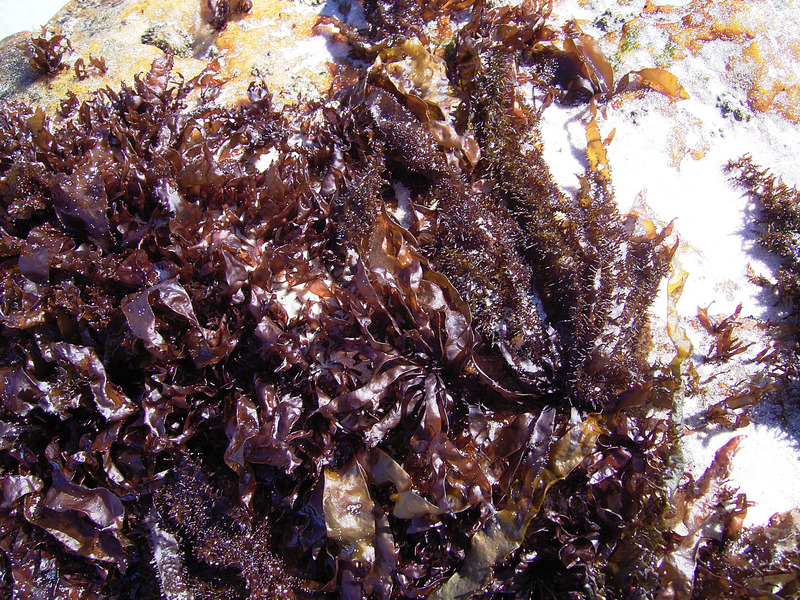 Thallus foliaceous, yellowish-brown becoming black when dry, up to 35 cm long, rubbery/leathery becoming stiff when dry. Holdfast a small disc or crust; blades irregularly divided and incised and with numerous proliferations from surfaces and margins; blades to 5 cm wide. Internal structure multiaxial; medulla filamentous, cells 1.5-2.0 µm in diameter; cortex of anticlinal filaments ending in cells about 3 µm in diameter. Carposporophytes present as gonimoblasts lining the inner surface of conceptacle-like cavities; spermatangia in conceptacle-like depressions in surface of blade. Tetrasporophytes crustose, multilayered, with cruciately or irregularly-divided tetrasporangia in superficial sori among paraphyses; tetrasporangia 24-30 µm long, 10-17 µm wide. Epilithic in the mid-lower eulittoral, often associated with sand. Found from Cape Fria in Namibia, along the west coast, to East London. (1-41). World distribution: Southern African endemic. Type locality: “Cape of Good Hope” (Silva et al 1996). Note: The life histories of this species and N. ovalis are described by Anderson and Stegenga (1985). The crustose sporophytes are apparently well-suited to surviving sand burial, so that these species are often associated with sand. 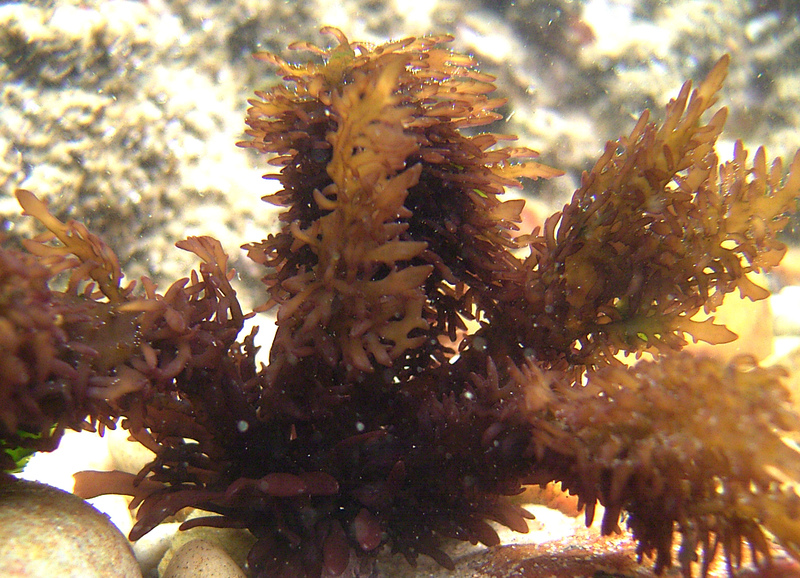 Nothogenia erinacea, female gametophyte seen under water. Nothogenia erinacea. 1. Habit. 2. Section of blade. Reproduced from Stegenga et al. (1997). Anderson, R. J. & H. Stegenga 1985. 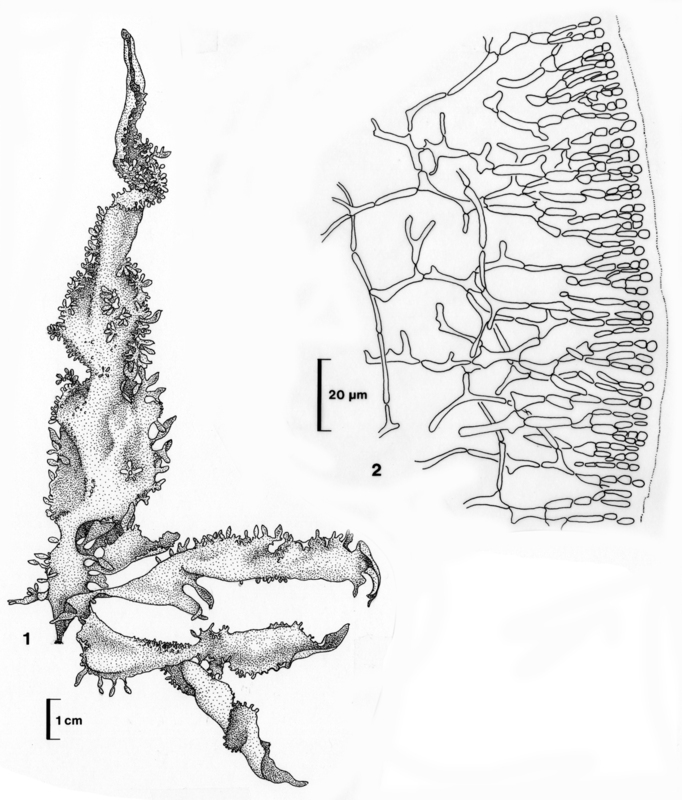 A crustose tetrasporophyte in the life history of Nothogenia erinacea (Turner) Parkinson (Galaxauraceae, Rhodophyta). Phycologia 24: 111-118. Parkinson P. G. 1983. The typification and status of the name Chaetangium ((Algae). Taxon 32: 605-610.